"La formica è sullo zucchero." Translation:The ant is on the sugar. Wait a minute, didn't the ant already meet an untimely end in said sugar? It's the highly anticipated sequel about the former ant's son. La Formica Oscuro: Un Gioco di Zucchero. This time the ant means business. It's got four Oscars already! It's the prequel explaining what the ant was doing there. All of these mean: "On the." You can also check out this website for the other prepositions too! What is the site? The link does not work. Incredible thanks. Finally this makes sense. Excellent illustration, it enabled me to see still more similarities to French apparent when you listen, but often obscured by the spelling and I still have the ghost of a memory of school French. If you observe closely you can find close connections between languages. I think a for at is still common to both languages, not sure and of course in is blatantly common to English and Italian. I just printed this out. So helpful. Thanks! how are the sul words different from the nel words? The Sul words mean On and the Nel words mean In. thank you. are the al words "to" or "at"? Would it be weird for an Italian to hear "La formica e nello zucchero," just as it is weird for an American to hear "The ant is on the sugar?" I'm glad you brought this up. As a Native American English (pun intended) speaker, I've never heard of anything "on" the sugar. I completely understand, but it sounds incredibly awkward, unless it were on a container of sugar or something. ??? what do you mean "stop the clutter" ??? I've read the comments below and would like to agree... there is no situation in english where one would say "the ant is on the sugar". agreed, unless the ant is on a cube or a bag of sugar. But let's face it, the ant isn't on the sugar when it's spilled on the table, or in the sugar. The ant is stealing the sugar. There is an ant and a bag of sugar. The ant is crawling on the bag of sugar. I would say "the ant is on the sugar". You spill sugar on the table. The ant comes, and now the ant is on the sugar. There you have it. A situation in english where one would say the ant is on the sugar. Sugar does not always exist in a bowl. No, the ant would still be "In" the sugar, in the sense that it is "among the grains of sugar". But since sugar is an uncountable noun, it is more correct to say "in" in English, even in a situation where the sugar is spilled on a table, etc. The only possible situation where an aunt would be "on" the sugar is like someone else mentioned, if it was a sugar cube. Is there not a different word for sugar cube (a countable noun) vs. sugar (an uncountable noun) in Italian as there is in English? 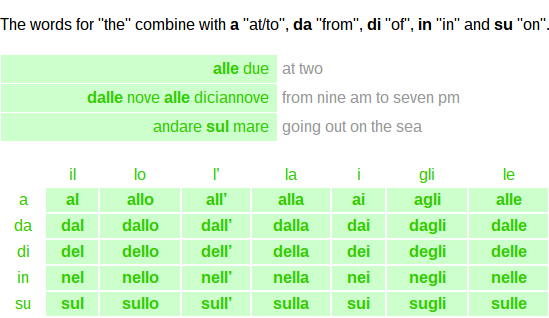 Think of it this way: In Italian the same word is sometimes used for either in or on. If this is the case then the English translation should allow both. You must be new awlazel, or kidding, Duo is still in the stone age of English BRT translation, has not jet entered the UK translation, forget American English ( Internet English), World translation will hopefully be the next step. Than my dear friends we will have to pay big times, than they also wake up to have "native audio speakers, so grin and smile just call blunders Duodingo, and go on with the next chapter, but write it down to answer Dudingo next time around. Duo is still the best for learning languages free of charge my friends love it, got soooo many hooked on it. Word soup or word salad? I want to use this phrase right now. How useful. Why are their so many bugs in the sugar!?! Why!? The similar one before you had to write in not on but now you have to write on but not in. Pero, perche not "nello"? why "sullo"? "The ant is on sugar" is marked as wrong even though no "il" was given? Are we just supposed to know when and when not to add 'the'? No "il", but did you notice "sullo" in p[lace of "su"? Yes, sullo is a contraction of su and lo. You will find similar contractions with other prepositions. Congratulations on your new learning. This is how DL teaches. A bit rough, but effective! Where is the 'the' is is question? Or does sullo imply 'the'? Wait, just one ant? Really? Because usually, ants come in groups. That's what happened in my house. The dictionary hints did not list "sullo" with the meaning "on the". I don't think a native English speaker would say "on the sugar" for an ant walking across the sugar bowl, or even posing on it. We would say the ant "is in the sugar". Given the relative size of an ant's legs and the grains of sugar, it really is IN the sugar, not just "on" it. Seriously. ..I am overwhelmed by these juvenile responses! Come Nerevar, friend or traitor. Come and look upon the heart. Why "lo zucchero", not "il zucchero"? "Gli uomini scrivono nello zucchero." Qual è la tua parte preferita?